Running provides so many benefits beyond the obvious one of physical exercise. It’s also a stress reliever, can be very therapeutic, and, for many, it provides a huge sense of accomplishment. While some run solo, for others it’s a social activity. If you are even a semi-serious runner, you know gear is critical. You must have the right shoes, the right clothing, the right sunglasses, the right support socks, and even the right undergarments. And beyond the essentials, there are things all runners like/need to carry with them, such as water bottles, music players, credit cards, money, photo ID, smart phones, keys, gel packs, and nourishment. It’s almost impossible to fit all of these things in your pockets and super annoying to carry any of them in your hand. Enter the running belt. Thankfully, running belts exist. They are a great invention. In fact, there are many to choose from. Once you start to shop for one, you’ll find a plethora of options available. Here we have narrowed the field down to three running belts that are up to the challenge of making your run smoother. In this review, we reveal the overall best running belt, the best running belt for the money, and the best running belt on a budget. They each represent very good choices but you may find one better suits your needs. This review will set you up well to finding the right running belt for you. This is considered by us the best running belt on the market! The FlipBelt running belt is sleek and cool. Not only is this an awesome belt in terms of functionality but is also a great one for those who care about style. It looks modern and hip. But more importantly, the design is also very ingenious. It’s tubular, without any zippers or snaps. Slide the belt up to your waist, slip items into the “tube” through one of several horizontal openings, flip the belt towards you, and voilà, you are ready to go. All of your items are held snugly against your torso. At 3-ounces in weight, you hardly know the belt is there. We also love that is available in several colors so you might as well buy more than one. It’s nice to have options depending on your running gear of choice for the occasion. The Camden Belt is very functional. It is a great belt for carrying water with you and actually comes with two 6-ounce BPA free water bottles. It also has a large front pocket to hold other essential items. We like this belt because it’s no fuss, no muss; just a solid reliable running belt. It’s a great belt for outdoor runners who have no choice but to bring water with them. It is well made and, although it looks bulkier than the other belts reviewed here, it is surprisingly lightweight and fits well. Its one drawback is that the credit card/ID sleeve isn’t of the same quality as the rest of the belt and is prone to tearing. That said, it’s a minor drawback when weighing this negative against all of the belt’s positives. Flip belt to have either the touch screen & zipper, with earphone hole for enjoying music. The EOTW Belt is designed to serve one purpose very well, and that is to store your phone. If you’re a runner, you know it’s critical to have your phone to play music, track your route, your pace, your distance, etc. The FlipBelt isn’t large enough to fit the largest smart phones, but the EOTW succeeds here. The phone storage pouch is available in two sizes so you can discern which you need to fit your phone. Of course, it stores other items as well but its greatest strength is the ability to accommodate large phones. This belt can’t hold water bottles but if your large phone (or any phone) is your primary concern, this might be the belt for you. Its touch screen clear panel also means you can control your phone through the belt – a very nice perk. As we mentioned earlier, if you are even a semi-serious runner, you know gear is critical. And the gear you choose is going to be very specific to your needs and your style. If you run only indoors at a gym, then carrying water bottles with you isn’t essential but your smart phone might be. If you run great distances then you likely travel with gel packs or something else to give you boost. If you run marathons, then carrying a credit card, your ID, and your car key will be important. It can be tough to fit some, or all, of these things in your pockets and can also be a big hindrance to carry items in your hands. Thank goodness for running belts! These ingenious little gadgets can pack a huge amount of convenience and a great deal of style. A friend of mine was training for a marathon and at the start of a long training run in cottage country, she ditched her water bottle because it was annoying her. By the end of her run, she was sweltering, dehydrated, and dying of thirst. She made it back to where she had tossed the water bottle but the top had fallen off and the bottle was empty of water. Desperate, she crouched down and drank from a scummy puddle at the edge of the country road she was on. If she had a running belt, this never would have happened! There are a lot of running belts on the market so we have narrowed the search for you. The following guide represents a great starting point as you begin to shop for a belt to fit your needs. The belts covered in this review fit slightly different needs so make sure you have your checklist of must-haves. 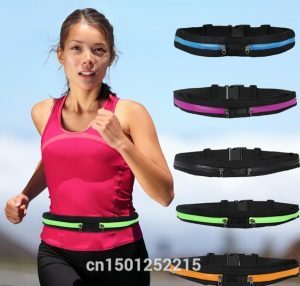 There are several key things you want to consider when in the market for running belt. The following elements will set you off on the right foot (pun intended). It must be comfortable to wear, sit snugly on your waist, and not be prone to jiggling and bouncing around. Consider your needs. Not all belts will hold a water bottle for example. Make sure the belt you choose is suited to hold the items you need/want to carry. You will probably be a ball of sweat when you run. Make sure your running belt is suited to wick moisture away from your body where it sits but will also protect the items it holds from getting drenched. Consider whether it is constructed well enough to withstand the wear and abuse associated with running or jogging. Is the stitching strong, attachments well secured, and pockets durable? The selection of products available means you can find one right for your budget. And the reality is, none of the belts reviewed here will break the bank. We consider the FlipBelt to be the best overall running belt. Its design is very smart and sleek, and as a result, the competition doesn’t quite measure up. It is also quite affordable at the $30 mark. We absolutely love that the FlipBelt it is so lightweight. At only 3-ounces, it won’t annoy you or slow you down. It is constructed as one big tube, available in different sizes to fit your waist or hips. This means there are no zippers or fasteners. It just slips on and off. The tube has four openings so you can slip your items inside and then flip the band to conceal the openings. The smart and lightweight design means there won’t be any bouncing or jiggling. The belt hugs you comfortably, keeping all of your items safe and secure and at your fingertips. It also includes a slot with a key ring so you can attach a key safely and easily. The demo video also suggests you could attach other items to the “key hug” like a wedding ring. It is made of a Polyester/Lycra blend so it is ideal for moisture wicking, dries quickly and feels good against your skin. Further, it is available in an array of colors to suit your preference and is available in several different sizes, as mentioned, to suit various body types. The manufacturers also point out that you could easily wear it under clothes as a money belt. The entire belt is safe for a washing machine and dryer on low heat. If you prefer, you can also hang it to dry. We also really like that the logo is reflective for safer nighttime running. Some users have encountered issues with items falling out of the FlipBelt. This seems to be infrequent but naturally this would be an issue should it happen. To prevent this, make sure items are packed snugly in the belt, and in the opposite direction of the horizontal opening. Naturally the FlipBelt is also not large enough to carry a water bottle. 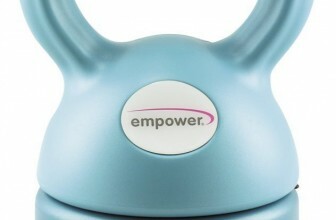 This isn’t a weakness per se, but if you are looking for something to hold your water bottle, this belt isn’t for you. We consider the Camden Belt to be the best bet for the money. It does very well on all of the key features. 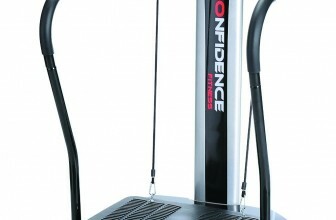 Further, it is very reasonably priced at $20 and is definitely worth the money for the serious runner. Unlike the FlipBelt, it is designed to hold water bottles which is a must-have for most outdoor runners. We love that the Camden Belt packs some serious power with dual water bottle holders and a large pocket. While the FlipBelt is ideal for gym rats or marathoners (where water is more regularly available), the Camden is ideal for serious outdoor runners. It actually comes with two BPA free 6-ounce water bottles so they are a perfect fit for the belt. Further, the pocket is large enough to hold whatever you need. It also comes equipped with a plastic sleeve for credit cards or ID. The belt adjusts to fit a waist up to 47” so it’s a one-size fits all approach, which means you can’t go wrong. It is also made of lightweight materials. This coupled with the snug fit, means bouncing and jiggling is minimized. That said, in order to ensure bouncing is minimized, make sure you wear it on the narrowest part of your waist. If you pull it down to your hips, it will bounce around and chafe. It might look a little dorky up that high, but that’s the way to make it work its best. We can also see that it is carefully constructed. The seams are well sewn and the velcro attachments are well secured. The water bottles pull in and out easily which is essential when running. We also really love that the Camden Belt is backed with a 100% money back guarantee. Reports are that customer service is very helpful if you have a question or need to arrange a return. 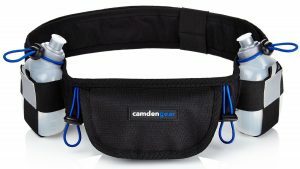 The Camden Belt is nicely designed and we appreciate that it doesn’t try to do too much. It is a great running belt that holds water and other essentials – up to the runner – and is overall lightweight and easy to manage. The slimmest runners might find this belt too big. Some simply purport that they couldn’t get it tight enough. Others complained that the pocket was too small for larger phones so make sure you consult the manufacturer’s specs if you have an oversized smart phone. Some users indicated that the plastic sleeve for credit cards or ID was too flimsy and ripped easily. Overall design allows runners to easily and comfortably carry water. Flimsy plastic credit card/ID holder prone to ripping. We consider the EOTW Running Belt to be a great product for those on a budget. Available at the $10 mark, its design is sleek and subtle. This belt is ideal for those who want to carry a large smart phone. If this is your primary requirement, your runs will be more enjoyable as a result of this belt. And the reality is, at this level of investment, it can’t hurt to try. 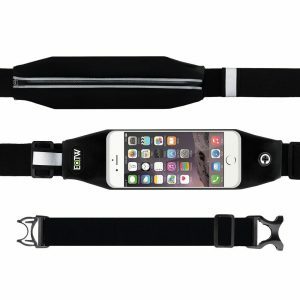 While this belt isn’t going to hold water bottles, it will fit even the largest of smart phones so this is a strength over the previous two belts reviewed. It is available in two sizes for this reason – 4.7” and 5.5” – so it’s up to you to decide which size you need. It comes equipped with a touch screen panel so you can control your phone while it is safely secured inside the belt. The belt also allows for you to flip the main pocket from front to back so you can either have the touchscreen and ear bud jack facing out, or the zipper. Your choice. 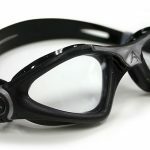 It is durable, waterproof, and sweat proof. It will protect its contents from moisture better than the other two belts. Furthermore, it includes two pockets so you can organize your contents just how you want. It can be easily cleaned by hand washing. We also like that the waistband is adjustable from 20” up to 35” so it will accommodate a wide range of girths. It can also be modified for use as a fanny pack or shoulder bag. A half-meter strap extension is available for purchase to make the modification easier if need be. 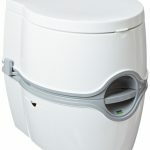 Further, this extender also means the running belt can be used for waists up to 55” around. Some consumers report that the touch screen doesn’t always touch the screen of your phone. Naturally this makes it tough to operate your phone if the belt panel blocks access. Some users also complained that when the belt is flipped with the zipper facing in, it’s difficult to access items since the belt is turned backwards. Designed to hold oversized smart phones comfortably. Touch screen panel doesn’t always work. 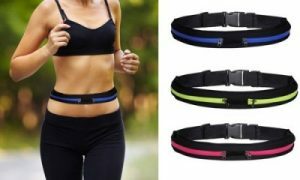 Considering that a running belt will be a part of your running regimen, it is important to choose one that will fit your needs. After all, once purchased, it could make or break your run. The last thing you want to do is groan at the end of a run (or worse, mid-way) because your running belt let you down. For folks on a more limited budget, the EOTW is the one we recommend; however, if water bottles are key for your run style, and it is possible to stretch the budget to afford the Camden belt, you won’t be disappointed. For hard-core runners who care about extra weight and the look and style of their belt, then the FlipBelt may very well be your winner. Running is tough (enjoyable but tough!) but a well-designed, high quality running belt can make your runs smoother by holding everything you need right at your fingertips. If the perfect belt can shave time off your personal best, then we say it’s worthwhile investment and we know you’ll agree.